Atlanta-based Nigerian Afrosoul/Folk/Jazz singer, Songwriter and Storyteller has been singing for more than two decades at festivals, intimate music spaces, concerts, churches, events and in theater, during her years in London, as a member of the vocal ensemble of select Broadway shows including ‘GodSpell’ and ‘Rent’. Tosinger comes with a musical flow that’s as soulful and ethnic as it is a sheer loveliness of heavenly inspiration. Her vocal essence and sound has been described as soothing and uplifting and her voice displays a simple conveyance of heartfelt richness. An eclectic artist with a warm personality and matchless passion, she names her African heritage, Ambient, Worship Music, World Music, Folk, Soul & Jazz as influencing her musical creativity. She also mentions legendary artistes such as Miriam Makeba, Nina Simone, Angelique Kidjo, Sade Adu and Tracy Chapman among others as influences. 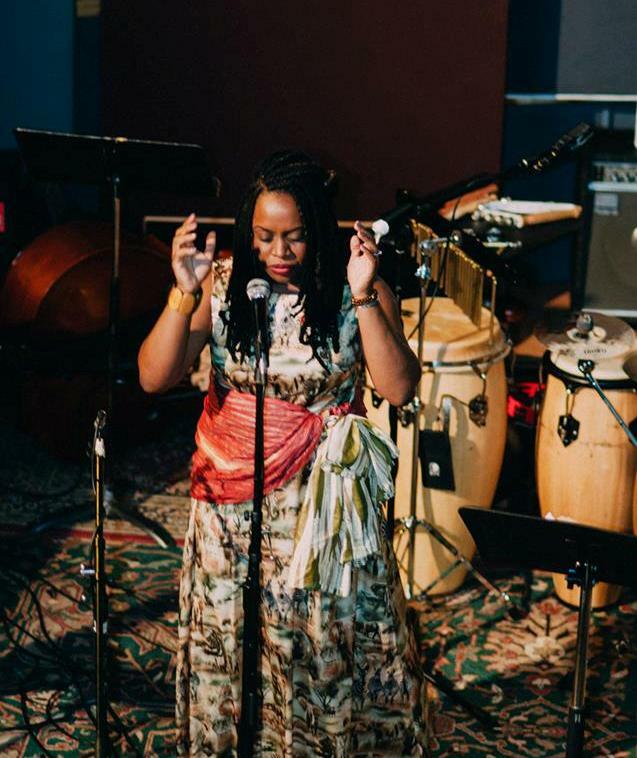 Tosinger is unique in her compositions as she occasionally incorporates her Yoruba language/culture on a contemporary soul, sometimes ambient/jazzy/folksy platform. She released ‘FINALLY’ an EP of 6 tracks early 2012 and in 2013 digitally published – The ‘AfroSpire’ Demo – a collection of songs with African sounds, Yoruba sayings and inspirational lyrics on a contemporary musical platform. A Women4Africa UK ‘International African Woman of the year’ awardee and a recent opening act for legendary African Jazz Musician, Lagbaja, Tosinger self-released her original full studio debut album titled ‘Organically Singing’ in the summer of 2015 which is currently available on all major digital outlets. She also tells African folk stories on her YouTube channel at “Tales with Tosinger” and on WRFG 89.3 Atlanta Radio. Tosinger is very much on her way to warming her music into the hearts of lovers of organic music globally as she continues to brand herself in the Afrosoul/World music scene while her message remains consistently inspirational. For more info, visit http://www.tosinger.com. 1. Pls tell us about your musical background. I was brought up around an eclectic mix of music ranging from traditional Yoruba apala, juju, fuji and folk music from my grandmother’s 24 hours on blast radio, to classics, to pop and soul from my mother’s music collection. I also grew up in and around the church, being a part of a Catholic Church choir as a little girl with my beloved Grandma of blessed memory, Madam Georgietta Abeke Adesina. Later in life, I was surrounded by the music of charismatic, pentecostal churches, so Gospel music and Christian contemporary music also played a part in shaping my musical mind. As an adult, I have come to fall in love with Jazz and world sounds and all this has also contributed to my creative milieu of music tastes and preferences. 2. Why did you organise the ‘Fortified’ concert? I turned 40 on January 27. The Fortified concert was my way of celebrating a so called milestone age in a non-traditional manner. Instead of the typical (Nigerian) party, I gathered a few friends and family for an intimate concert where I headlined and engaged my audience from beginning to end for 2 straight hours with a live band. It was a way of challenging myself, a milestone event to usher in a new age/phase. God, Nature, Family, the African continent and Legends who have walked the path. 4. Why did you move to the USA? I moved to the USA by virtue of marriage. I met my husband, Olu Taiwo, he was visiting while I was rounding up my graduate studies in the UK and I moved thereafter to join him. 5. What do you think of Nigerian music in general? Hmm. Nigeria music is multi-faceted. I can say it’s doing well in terms of commercial success and international recognition with regards to the afrobeats genre of music with the likes of Tiwa Savage, Davido, Wizkid, Teckno etc. But, I will always remain an advocate for the indigenous, cultural, traditional music from the African continent, Nigeria inclusive, (classified as “World Music” in the west) and hope it will experience as much notoriety in terms of communicating the real culture of the people, just like Angelique Kidjo represents Benin and Mariam Makeba represented South Africa, Youssou N’Dour represents Senegal. King Sunny Ade and Fela in those days represented Nigeria, who would you say represents Nigeria these days in that respect? 6. Do you see the young Nigerian afrobeats musicians as an industry threat? Threat ke?! At all, everybody should please stay in their own lane. Afrobeats musicians play their own role in the sphere of things. Personally, I enjoy some of them myself and they are great for workout sessions . Some make sense lyrically, others don’t, most sound the same, yet people still find it appealing. So be it, to each their own. I know myself, I know my style, I know my calling. ‘Gnothi Seauton’ which means ‘Know Thyself’ and you won’t need to compete or see others as a threat. 7. Would you rather perform in Nigeria or elsewhere? I’d rather perform anywhere, anywhere I find myself. Globally. It would be nice to get love from your own people, but you have to always go where you are celebrated. I would surely perform in Nigeria anytime I am there, if the opportunity arises. 8. Who are your musical influencers or inspiration? So many to count. To name a few- Tracy Chapman, Miriam Makeba, Don Moen, Nina Simone, Angelique Kidjo, Sade Adu, Cece Winans, Onyeka Onwenu, Ella Fitzgerald, Yolanda Adams, Whitney Houston, Letta Mbulu … the list goes on. 9. Who would you like to work with? Hmm. What comes to mind as I answer this question are Stromae, India Arie, Beautiful Nubia, Adekunle Gold and Sting. 10. What do you feel about Nigerian politics and American politics as well? I think it’s time for the old people to retire and let the vibrancy of the younger generation move the country forward. We are tired of recycling old policies that are not bringing about change. Yes there is wisdom in old age, in some aspects, they can remain consultants, if at all, but it’s insanity when the same people keep doing the same thing and there is no growth. The mentality needs to be reformed for progress to take place. And this applies to all. 11. What next from you? Well, I’m taking one day at a time as I continue to establish myself in the creative arena. I work towards leaving an imprint in the sands of time with the legacy of my music. I hope to inspire people as I do so. I have also just recently opened an afro artsy intimate music & events space to do more live band performances and to give other local indie artists a platform and an avenue of expression. It is called Terra Cotta and located in Atlanta (See http://www.terracottaatl.com). 12. Any parting shots to your fans? Let’s keep in touch. I live online at http://www.tosinger.com and I am on social media on Instagram and Twitter @Tosinger. Make sure you follow and I wish you all the best in life as you all walk in your God given purpose and destiny. Love, Peace and Beautiful Music – Tosinger. Reblogged this on The World, Works and Thoughts of Bolu Michael-Biyi…..